"Garnish with fresh herbs, if desired." In a large bowl, combine ground beef, 1/2 cup ketchup, tomato juice, salt, pepper, red pepper, eggs, bread crumbs, onion and 2 teaspoons mustard until well mixed. Line a 9x5 inch loaf pan with foil. Press meat mixture into pan. In a separate bowl, combine 1/2 cup ketchup, 1 teaspoon mustard and brown sugar until smooth. Spread brown sugar mixture over meatloaf. Bake in preheated oven 35 to 45 minutes, until no longer pink. Drain off fat. Let rest 5 minutes before serving. See how to make a comfort food classic, Nashville-style. 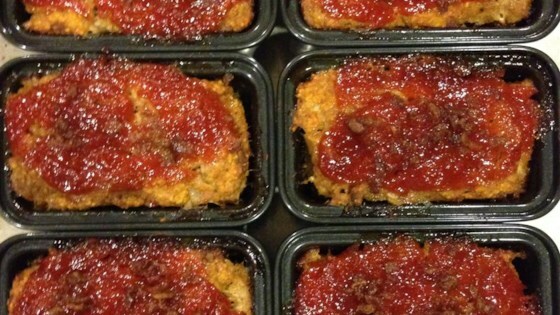 This is my new meatloaf recipe. I omitted the tomato juice and used worstshire instead, I also used ground turkey. It was fantastic, I can't wait to get home to heat up the leftovers! I love the sauce. When I made it the second time I doubled the sauce and poured some over the meat loaf when served. One of the best meat loafs I have had.